On the 9 March Kimberly Williams crossed off the second thing on her annual list. Every January, the 25-year-old triple jumper writes down her ambitions for the coming year. 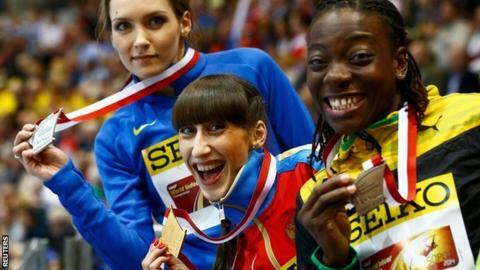 Williams had already achieved her first goal by making the Jamaican team, securing a medal at the World Indoor Championship in Poland was next. It's been a good start to the season for rising star of the sport. "So far I have accomplished two things on my list, to make the world indoors team and get a medal. I didn't care what colour it was. I just wanted to win," explains Williams. Winning bronze in Sopot was historic moment for the Jamaican as the achievement marked her first ever international medal. "In high school it is really competitive, if you can win at boys and girls championships, you can win anywhere. She is now hungry to reach more of her 2014 targets. "Improve on my personal best, make the Commonwealth Games team and ultimately win gold there," she reveals. The medal in Poland may act as good preparation for Commonwealth success, however one quick look at Williams' international record shows the victory has been coming. And Williams feels her best is yet to come. "I don't feel like I'm at the top of my game as yet," she adds. "There is always room to improve. "I trust my talent I know what I can do. It's only a matter of how I execute it. "I can't wait for the Commonwealth Games to come at the end of July, go out there and jump far to get that medal." Williams' Commonwealth Games preparations are in the spotlight this week as the Queen's Baton Relay travels throughout Jamaica. As a youngster she tried out a number of sports at high school before discovering triple jumping. "I used to be a sprinter," she said. "But I didn't like sprinting, I always thought I wasn't that fast, so I was trying find my event. Competing in the women's triple jump final at the 2012 World Indoor Athletics Championships. "My coach then, Patrick Johnson, he taught me how to triple jump and I loved it ever since." Her talent was spotted by Florida State University after she won multiple junior championships and was awarded most outstanding high schoolgirl athlete at the 2007 Penn Relays. Williams would go on to become the most successful female track and field athlete in Florida State history. Under the guidance of her coach Dennis Nobles she won the national championships five times and was a multiple athlete of the year winner. "I received a scholarship to go to the school and it feels great to go there. "After the Olympics, I got very confident as I realised some of the ladies that I used to look up to I was just as good as them or even better." The current women's triple jump world record is 15.50 metres and Williams has the record in her sights. "I'm better than 14.62 which is my current outdoor PB," she adds. "To consistently jump 15 metres, that is one of my goals. I don't know if it's going to happen now or later, but it's on the list." Williams is part of the most decorated Jamaican track and field team in history and she believes the foundations of that winning mentality start at a young age. "In high school it is really competitive, if you can win at boys and girls championships, you can win anywhere," she continues. "The level of confidence that it builds it just fills through you. You believe that you can do anything. I don't think there is any secret, we have just been competing since we were really small." Jamaica's Kimberly Williams competes at the London 2012 Olympic Games. Williams laughs as she recalls the positive reception in Jamaica when she returned from Poland with the bronze medal. "Coming home the reception I got from all my fans and my family, it was great, I really love that feeling and I'm hoping to continue to be successful so I can keep everyone happy," she recalls. "Now I have a medal more people come around and everyone recognises you. When I go to the stop light in the car, you see people pointing me out. It's kind of new but I love it." The Commonwealth Games is the next big event Williams is looking to cross from her list. "I have to get my mind right, go out there and jump and have fun, she said. "I've never been to Glasgow before. I hope the weather is good, I like sunshine."